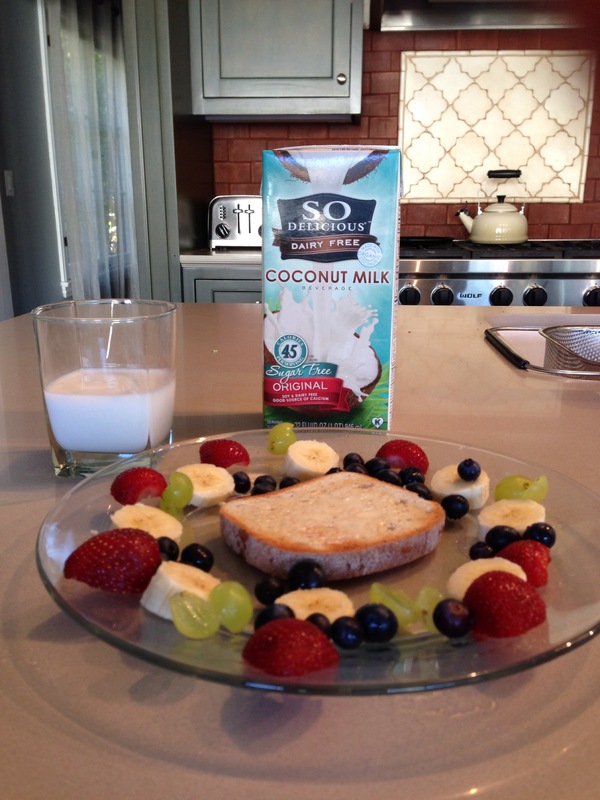 My review today is about something that is a good source of calcium: I’m reviewing So Delicious brand coconut milk. We usually use it for breakfast – in pancakes, in cereal and those kinds of things. But today my mom just gave it to me as a glass of milk. You can see the ingredients in the photo and that there is a lot of vitamin B12. B12 is good for vegans and vegetarians. Of course my mom didn’t just give me milk for breakfast. She gave me a plate with grapes, bananas, strawberries and blueberries and a piece of toast in the middle. It looked SO DELICIOUS – do you get it?! This breakfast gave me good energy to do this post which I need because I’m going hiking today which is excellent exercise. But first I’m going to be lazy and watch the French Open. Sometimes it’s good to have a lazy Sunday to watch TV. A lazy Sunday watching the French Open sounds like a great idea! Next year we should spend that lazy Sunday in Paris! And next year we can have a lazy Sunday in Brazil for the Olympics!